If only sharing the road with semi-trucks was limited to your kids giving them the signal to blare their horn. Unfortunately, that’s not always the case. Accidents happen on the road, but when it involves a semi-truck, the injuries can be devastating. Even when drivers of such large vehicles are well rested, experienced and highly skilled, they’re still trying to control a massive piece of machinery. 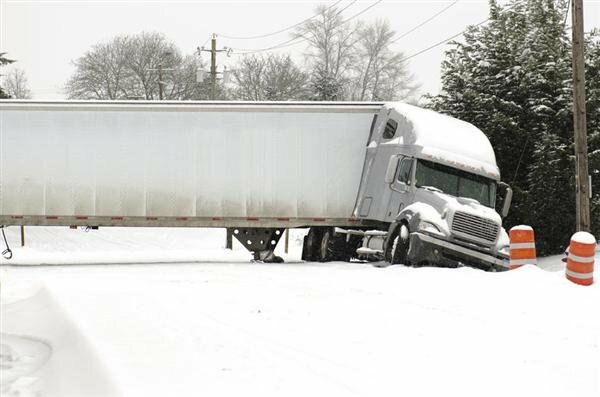 Things get even worse when truck drivers face harsh conditions like the storm in Dallas last week. It takes longer for semi-trucks to slow down and stop, plus the drivers have plenty of blind spots. These vehicles are also more likely to kick up debris, which can cause instantaneous windshield cracks to other cars on the road (and the resulting lack of visibility). If you’ve been involved with an accident with a semi-truck, you may quality to file a personal injury claim. Sadly, semi-truck drivers are notoriously “forced” to get behind the wheel for long stretches and with little sleep. However, not all drivers are cross-country. Many are local, and if they’re used to driving in the usual Dallas temperate climate, having to suddenly drive in freezing temperature with slick roads can be a challenge. A number of semi-truck accidents happened last week, such as the 18-wheeler which lost control on I-45 near Simpson Stuart Road. Fortunately, there were no injuries but that’s not always the case. Anyone injured with a semi-truck collision should check with an attorney about a potential claim. Call us for a free consultation, our Dallas personal injury attorneys will meet with you to discuss your options. Our phones are answered 24/7 at (214) 509-7555.